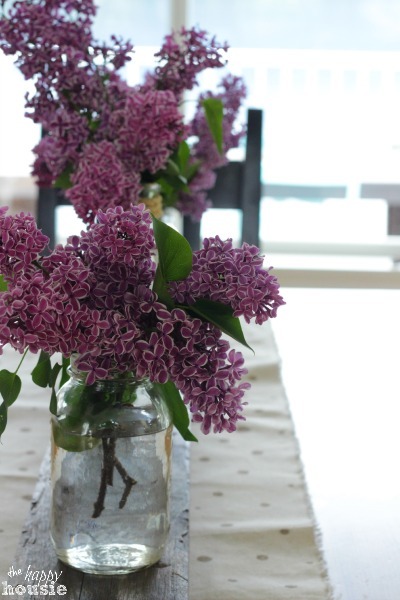 Hello readers of Savvy Southern Style! in the future. But I think the room that I most love to spend time in with my family is our light and bright living/dining room space. 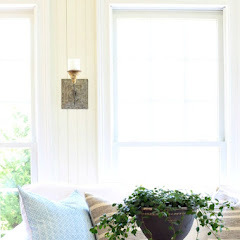 My favorite feature of the living room side is our big windows and the high ceiling. I love how much light it lets in and how open and airy it makes our room feel. 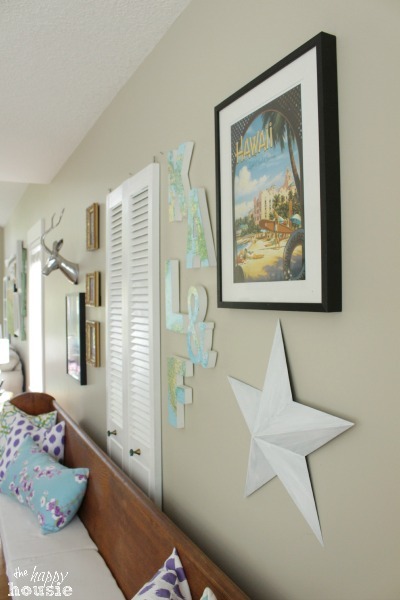 That, along with the thick white trim, balances out all the colour that I love to incorporate when decorating. 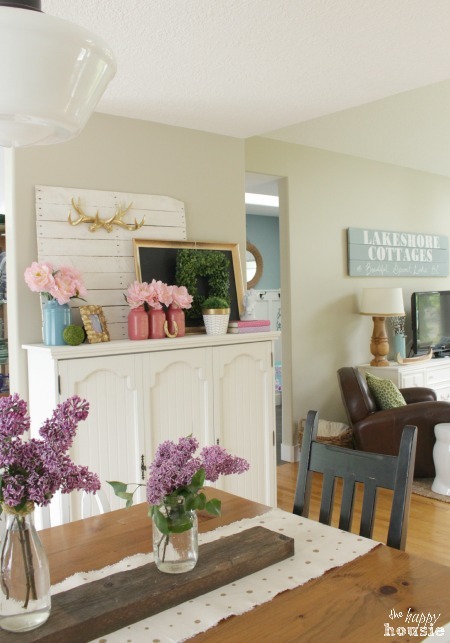 Because we live on a lake, I wanted to create a lake front coastal cottage feel when decorating this home. Many of the pieces in our living room area were second hand finds that have been cleaned up a little paint... like our octagonal glass coffee table, and side tables. Even the oil painting, old window frame, oars, and spindles on the gallery wall were second hand finds given some new life with a little paint. 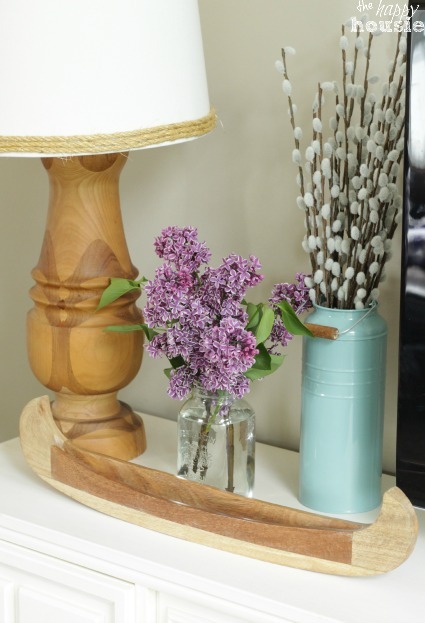 In fact, the broken dark teal oar came in that colour and I loved it so much I used it to match the coffee table paint colour too. I would say that was my first colour choice for this house and our decorating scheme came out of that. I love to change my pillow covers and colours with each season... this spring I decided to add in a little purple. I make my own pillow covers by following a really simple DIY Envelope Pillow Tutorial that I have shared over on my blog. The little lamp in the background was a horrible mottled brown color... a little white spray paint and a new shade (found on clearance) and it is a brand new piece. The gold frame was a garage sale find, and I picked up the yellow table at a second hand store and fixed it up with some DIY chalk paint in a Benjamin Moore colour called "Mellow Yellow". 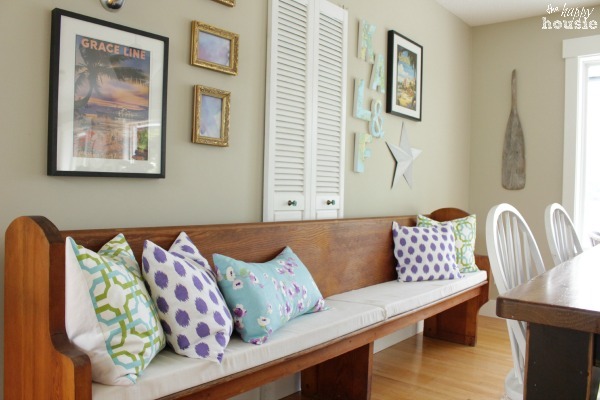 The window bench was made out of an old coffee table that I picked up at the Sally Ann. We just painted the base, added some foam and batting and upholstered it with some pretty striped fabric. I recently turned plain & basic wooden crates from Walmart into these numbered bins and we use them to keep our boys' books and puzzles out of sight when not in use. One of my favourite 'side tables' is this old cheese drum that I picked up at a garage sale... it even opens up and can be used to stash extra stuff if need be. Our TV Cabinet is an old dresser from the Salvation Army that we modified slightly to house our AV equipment... 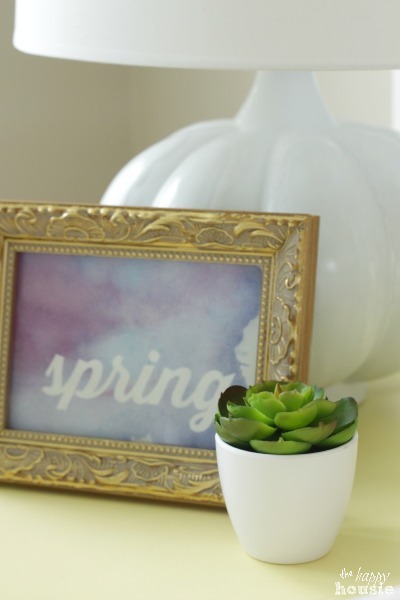 I used some DIY Chalk Paint in yellow at first but then painted in over in white a few months ago. I love choice number two much more... 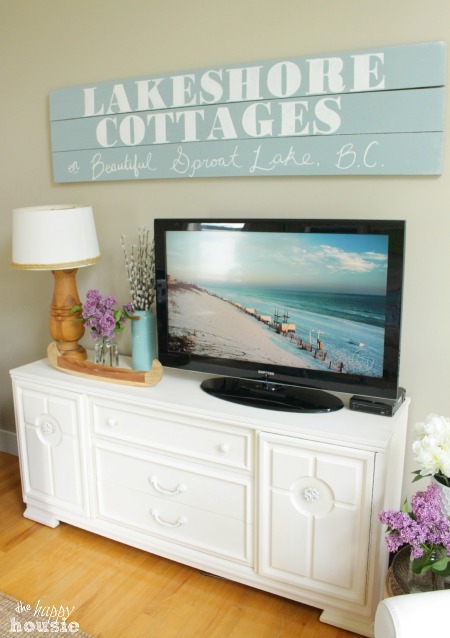 The Lakeshore Cottages sign was a project I shared last spring using some reclaimed boards - a cheap and easy way to create a large graphic piece for above the TV. I also found the wooden lamp at a garage sale for only a few dollars. I just gave it a new shade and added some sisal rope around the base . Our living room flows directly into our dining room - it is really just one big open space. I found that waterski at a garage sale soon after we moved in and knew that I wanted to hang it on a wall somewhere in our house... living on the lake we love to watch people out doing watersports. 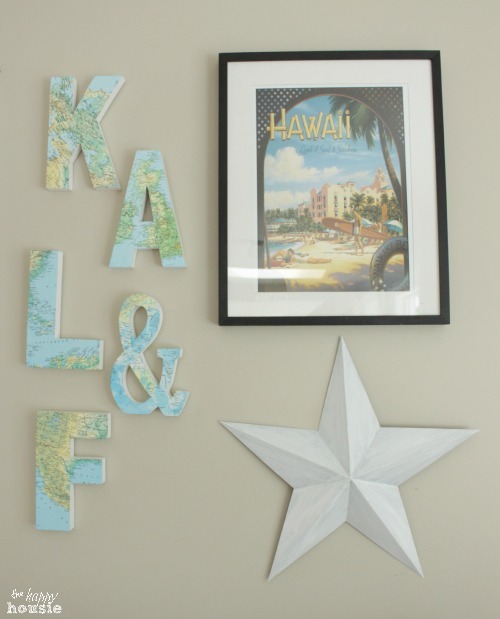 I made the map letters by decoupaging maps cut from a thrift store Atlas onto some wooden letters that I got at a craft store. The art prints are taken out of an old calendar...but I switch up the art in those frames fairly regularly with the seasons. 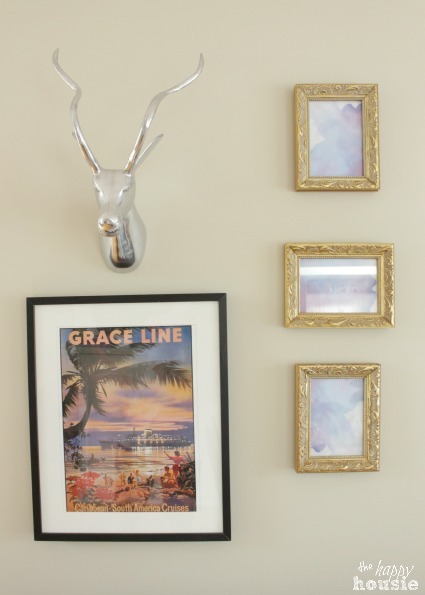 I love our silver gazelle... he was picked up on Clearance at a nearby home décor store. The gold frames were a recent garage sale find and to fill them I just printed off some watercolor pattern that I found online. Thanks again, Kim, for having me here today!! It is such an honor to take part in your Favorite Room Series! Thanks for reading. And remember my housie friends, HOME isn't built in a day. Enjoy the journey. Thanks so much, Krista for sharing your favorite space with us. 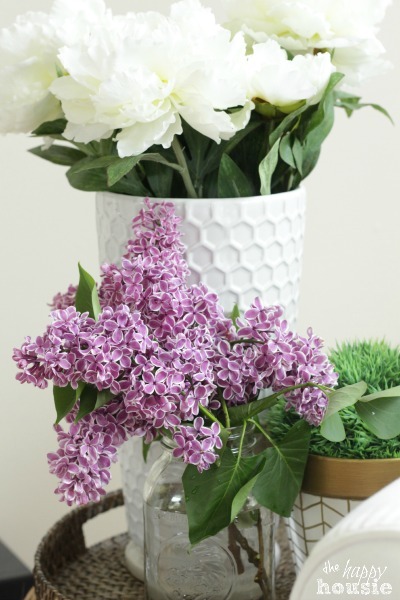 It is just all so cute and I love the addition of purple you added this spring. 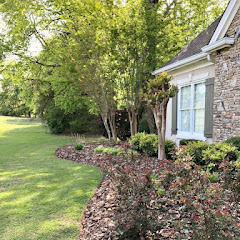 Okay, y'all if you don't know Krista and her blog The Happy Housie be sure to pop over and look around and say hello. Be sure to come back tomorrow for a giveaway with five winners! If you are away from the computer this holiday weekend I hope you have a happy and safe Memorial Day! I love Krista's home. What a charming lake home it is! 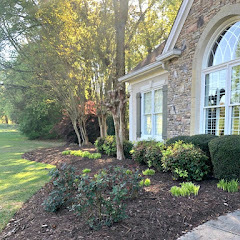 Krista, your home is beautiful and really draws people in with a welcoming feel. thanks for sharing her with us ,Kim. What a beautiful lake house. The neutral back ground makes all the pretty colours pop. What a great home. love all the details and how Krista repurposed a lot of the items. So pretty. I can see why this room is a favorite! It is so cheerful. And I especially love the silver gazelle and the spindles...awesome! Thanks for sharing. Love, love, love your style Krista! I still can't get enough of all the beautiful colors paired with the neutrals. Not many people can do this well - but you TOTALLY ROCK IT! 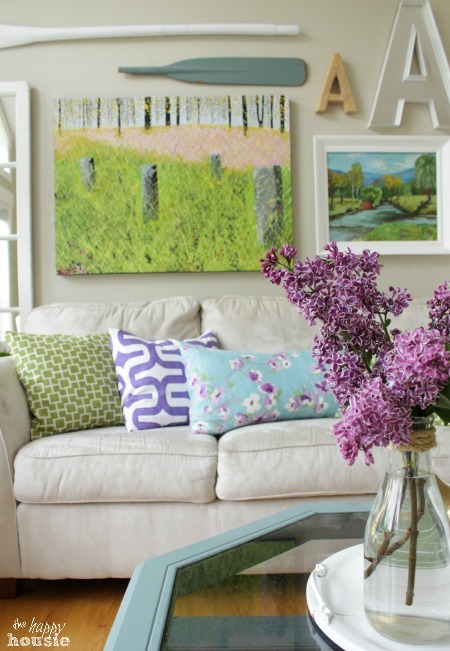 Love Krista, her home and her style! Fabulous Krista...and I'm so with you, it's hard to pick a room in my own home because I never feel like mine are finished either! ;) They are always ever evolving. 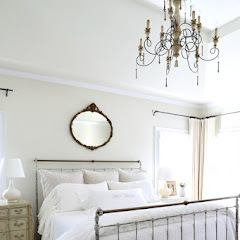 I enjoyed this post - the airy feel, the color and lots of white...so cheerful! 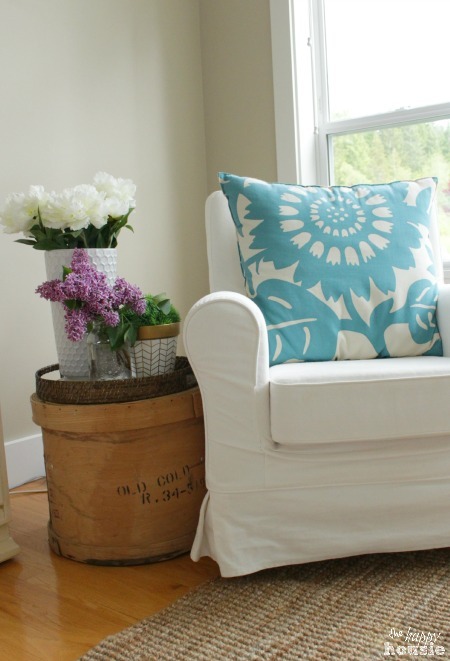 Love the use of found and thrift store items, too. I love this. It's so nice to see COLOR used. 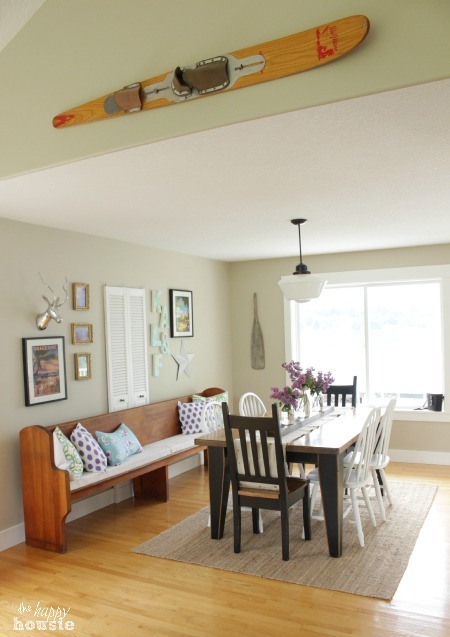 I will definitely be using those old Cypress Gardens skis we have on the wall in our Maine lake cabin. What a great idea! Beautiful!! 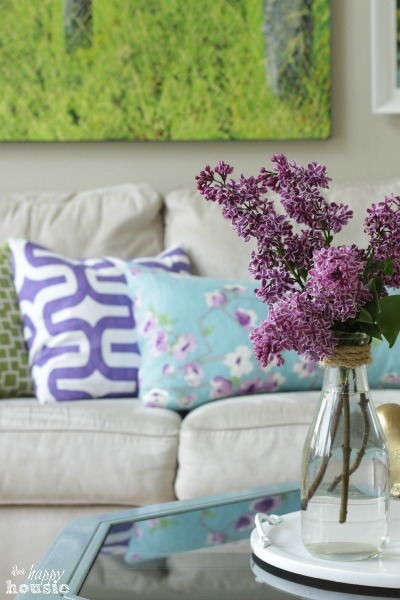 Krista has such a knack for mixing colors and patterns! Love her gorgeous home!! Your beautiful window just steals the show...along with all the colors of summer. Simply fabulous. 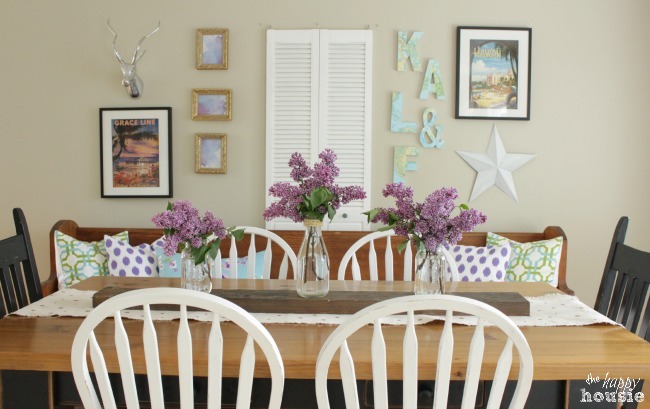 Krista's home is so fresh and pretty! 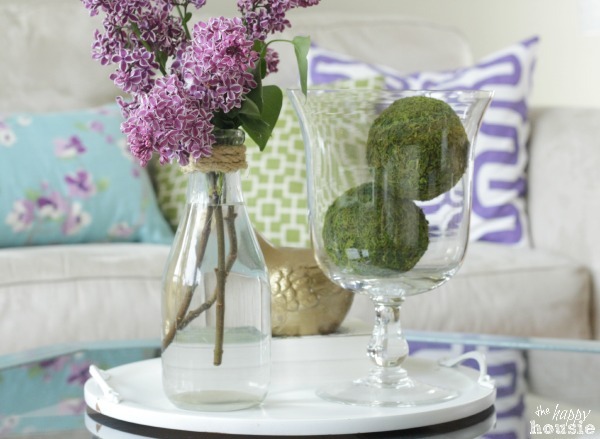 I love the beautiful colors she uses to accent different areas of the room. Just stunning! What a darling home! 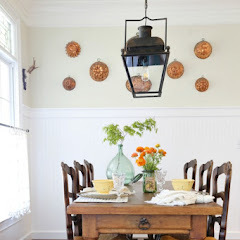 !1 I love her style and how she has decorated. 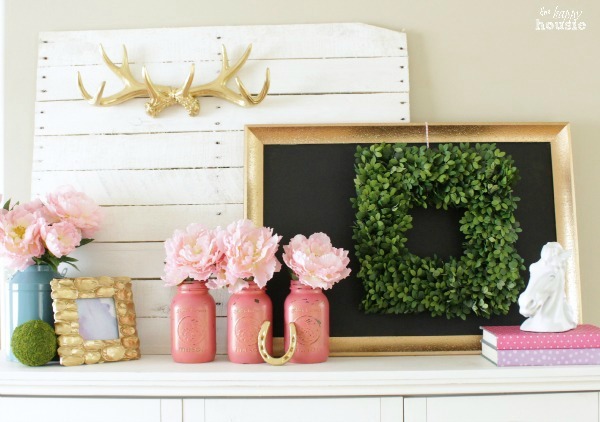 Her DIY projects are wonderful!!! So much inspiration!!! Hope you both have a great holiday weekend! Krista has so many great ideas! Her house definitely has a happy and wonderful feeling! What a beautiful room....love the pops of color! That is a gorgeous room! 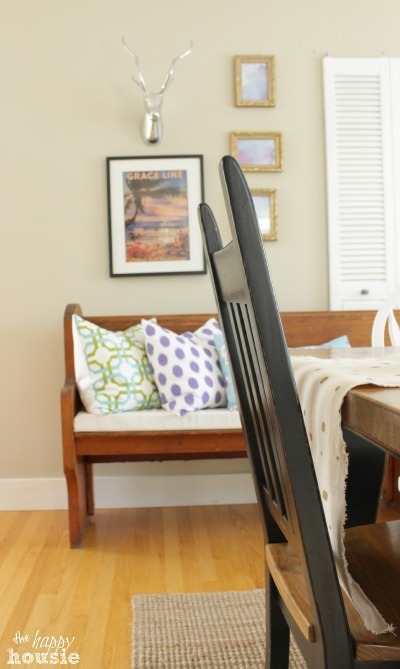 I love how Krista has transformed so many items in her home to make it look like a million bucks! 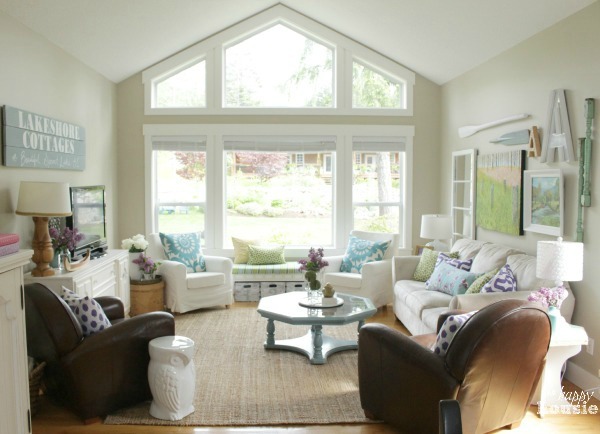 Krista, What a beautiful, bright and airy space you have! It certainly does have that lake front cottage appeal! I'm amazed at what you do with all your "finds". You have created such a delightful and welcoming space! Thanks Kim for another great house in this series and introducing me to Krista! 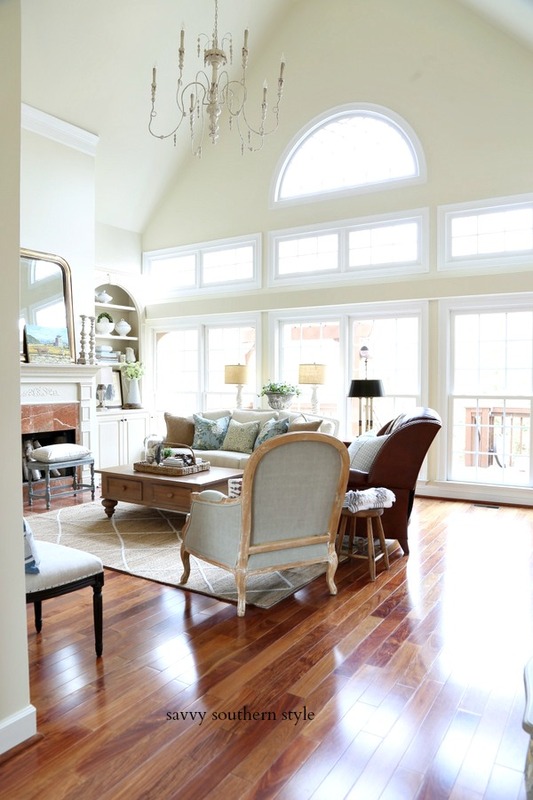 Love the light and airy feel of this living space! So pretty! Very fresh and inviting. Thanks for the close-ups of the neat idea pieces! I love all the great decorating ideas this home provides! Love the barely there numbers on the crates, the cheese box table, all the light colors... so pretty!